The Chicago Bears are in a very precarious position. They have already locked up the division and a playoff berth. Heading into Week 16, they are set to be the No. 3 seed in the NFC. But should the Rams lose to the 49ers and they beat the Vikings, they would become the No. 2 seed. Worth playing for, right? But how likely is it that the Rams, even with Todd Gurley sitting out, are going to lose to the 49ers? That is the question the Bears have to ponder leading up to kickoff but for the Vikings, the decision process is a lot easier. If they lose, the season is over. But if they win, they sneak into the playoffs. So deciding whether or not to play is not an issue for them. According to some early reports, Bears head coach Matt Nagy doesn’t plan on resting people for the playoffs. But it does sound like he does not intend on pushing guys with nagging injuries too hard. Wide receiver Allen Robinson has been ruled out (which may just mean we can finally see rookie Anthony Miller explode for a big day). On the defensive side, linebacker Aaron Lynch and safety Eddie Jackson are not expected to play either. As important as he is to the defense, it would not be shocking to see the Bears sit Khalil Mack or pull him early if the game begins to get out of hand. The Bears can survive without Robinson. The success of the offense is more dependent on the run than pass, but the overall success of the team is most dependent on the defense. If they sit too many of their starters, then the Bears defense—and the Bears in general – are going to have their backs against the wall in this game. Because the Vikings are starting to get it together on offense finally. The change at offensive coordinator has helped. Kirk Cousins and the offense is playing better, but the offense is still not running as smoothly as it should be at this point in the season. It was bad enough that it wasn’t working well under DeFilippo, but it has had to adjust to a new guy on the fly. At times, they have looked fantastic (i.e., Week 15 against Miami). But at other times it has not (most of the first half against Detroit last week). It definitely helps to have Dalvin Cook back, healthy, and getting into the swing of things. He has looked good over the last few weeks accounting for 460 total yards and three touchdowns the last four games. Cook has made a big difference in the run game with over 200 yards the last two weeks. With Anthony Barr back (he missed the first game against the Bears), the Vikings defense will be a little harder for the Bears to run on. If the Bears struggle to run, they will have to lean on their passing game. While Mitchell Trubisky has improved dramatically compared to his rookie year. Enough to carry the team against one of the better defenses in the NFL? 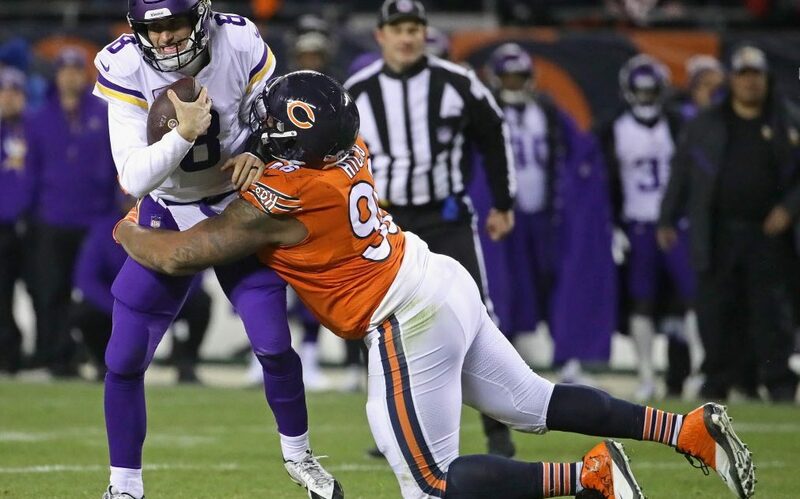 But the real questions are whether the Bears defense can withstand the new and improving Vikings offense, and if the Vikings offense can find its groove early enough against whoever the Bears play on defense to win the day. Early indications make it sound like the Bears could err on the side of caution with a lot of their defensive stars. That means the Vikings offense will have a good day and more than likely win the game. So, take the Vikings to win straight up and against the spread (-5.5). As for the over/under—it all depends on how many starters the Bears do not play on defense. If they sit a handful of them, take the over. The Vikings will do the bulk of the scoring with the Bears contributing just enough to cover the over.